« Help! … Do You Know The Name Of This Plant? I mentioned in my last post how we use an app called Evernote to log all our plants. 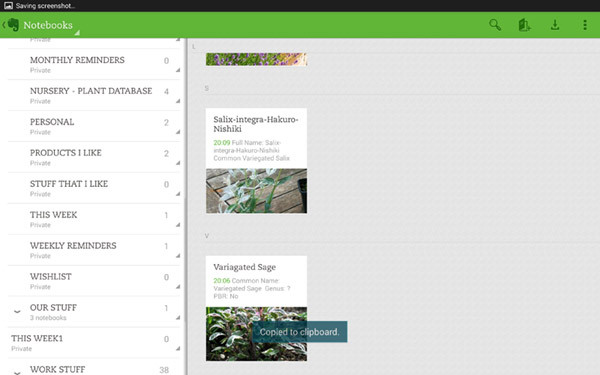 If you’ve never seen Evernote before then I’d definitely recommend taking a look. Essentially its a really easy and convenient way to take notes and review them on phone, desktop or tablet. The information is stored in the ‘Cloud’ which basically means you can access it anywhere providing you have access to a copy of Evernote. … and on my mobile phone. I have to say I think it’s brilliant but in the interest of balance … there are loads of other note apps out there that are comparable with Evernote. When I first downloaded it my immediate reaction was wouldn’t this be great for keeping a record of the plants in the nursery. It’s simple to use, has as a host of really cool features and best of all it’s free! Essentially it maintains a series of Notebooks in which you store notes. Think of Notebooks as folders or categories and Notes as individual pages. Each ‘Note’ is made up of text, photos, audio, video or a combination of. There are the usual formatting tools, bold italic, colours etc. and it has both Search and Tagging features which helps when you have lots of notes to search through. Tags are great and can make sorting your notes so much easier. For example you may want to find all the herbs in your collection but would rather not search through every note one by one. 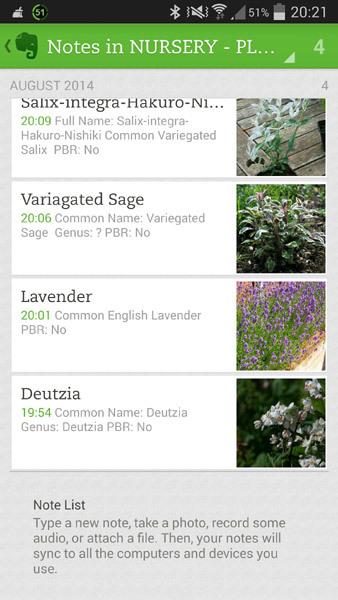 But if you create a tag called herbs and add it when you create a note it will make it much easier to find by simply clicking on the Tag feature and selecting the appropriate tag. We like to keep things simple here and so tend to stick to a combination of text and images but have been occasionally known to add an audio describing the characteristics of the plant or any unusual growling conditions. Each note has the full name of the plant and if applicable the common name along with details of the growing conditions. I also include a photo which comes in really handy as a reminder when the plant is out of flower. Its also really useful if someone asks the same question when they’re thinking of buying the plant. I just whip out my phone and show them. Here are a few suggestions for Notebooks. Herbaceous, Roses, Ground cover, Evergreens, Climbers, Shrubs, Moisture loving plants, Grow well on chalk, Prefer Dry conditions. If you want to learn more about Evernote there are loads of great videos on YouTube explaining every last detail but my advice is keep it simple and utilise the features that work best for you. 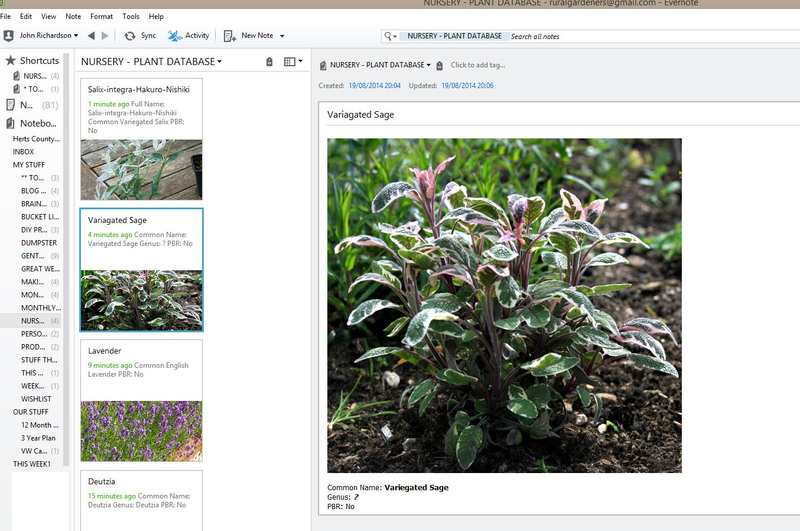 Hope you found this useful and do drop me a note if you’re using Evernote to track your plants as I’d love to know how we can make it work better for us.